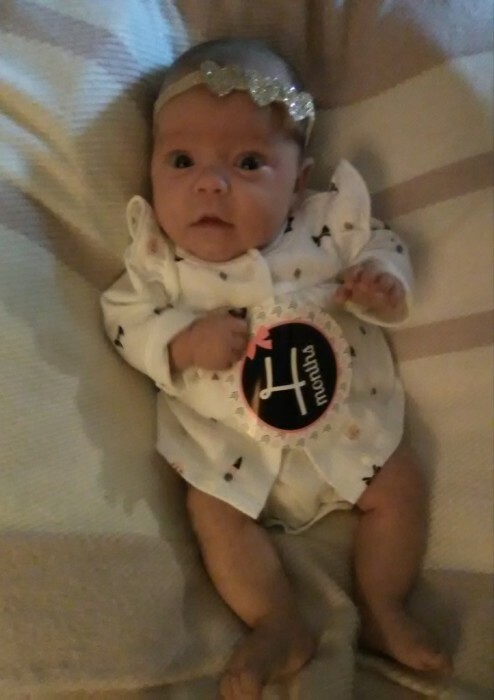 Paisley Jo Mills received her angel wings on Sunday, November 11th, 2018. During her short time here on Earth she touched many lives and was loved deeply by family and friends. Her life was a brief but precious gift to everyone that knew her. She was born on June 25th, 2018 at Deaconess Gateway in Evansville, Indiana to Timothy Joseph “Joey” Mills and Amanda (Moffitt) Mills. Paisley was preceded in death by her Maternal Great-Grandparents – Paul and Dorothy Moffitt and Leroy and Mary Ann Beyers; Paternal Great-Grandparents – Richard Stackhouse and Ester Wilson and Darrell Mills. A Celebration of Life Ceremony will be conducted on Wednesday, November 14th, 2018 at 12:00 (noon) p.m. at the Brosmer-Kemple Chapel with burial to follow in the Sulphur Creek Cemetery in French Lick, Indiana. Friends may call from 11:00 a.m. until the time of service on Wednesday, November 14th at the Brosmer-Kemple Chapel.